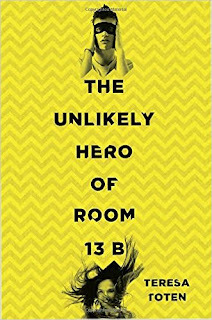 The Unlikely Hero of Room 13B by Teresa Toten, along with Simon vs. the Homo Sapiens Agenda, the fantastic debut novel by Becky Albertalli, are the two YA books I went out of my way to read recently, based on rave reviews by editors of kid's books. You can read the whole list for 2015 here. While different, I enjoyed both equally and hope they get all the attention they deserve. Like Simon vs. the Homo Sapiens Agenda, The Unlikely Hero of Room 13B features a winning main character who is keeping secrets. Adam Spencer Ross's life, already a lot to juggle, changes - for the better and the worse - when Robyn Plummer joins his OCD support group in room 13B. Dr. Charles Mutinda, or Chuck, has the members of the group pick their "nom de guerre," or superhero name to use during their time together. When Robyn chooses Robin, Batman's sidekick, as her alter ego, smitten Adam can't help but make the obvious choice - Batman. The presence of Robyn and the super hero alter ego encourage and inspire Adam to make some tough choices. He begins to do his group homework - making a list for Chuck that tracks his medication intake, his primary presenting compulsions (ordering, counting and magical thinking in regards to clearing rituals that allow him to cross thresholds) along with ten beliefs he holds. Adam wants to save Robyn by helping her to heal, and as he gets closer to her she unveils her own secrets and lies and lets herself lean on him. But, she also starts slowly getting control of her OCD and healing, while Adam, and the people he loves, seem to be getting worse. Adam is the only person who can talk his little stepbrother down from his increasingly severe anxiety attacks that just could be early signs of OCD. His mother, a nurse, is receiving threatening letters, each one more shattering than the next. And then there is the biggest secret of all, one that threatens to separate Adams's mother from the one thing left in her life she holds dear - Adam. Toten tells Adam's story with an intimate and masterful skill, capturing the nuances of being a teenager while also layering in the realities of living with a mental illness, one of which is lying. As Adam's story unfolds, so do the truths that he has been hiding from his friends, family and readers. Your heart will break for him, but it will also soar as he makes the hard steps toward controlling and conquering his illness. Adam is achingly real, and he is also intelligent, compassionate, brave and funny. It will be a long time, if ever, before I stop thinking about Adam and the other vivid, compelling characters in The Unlikely Hero of Room 13B.